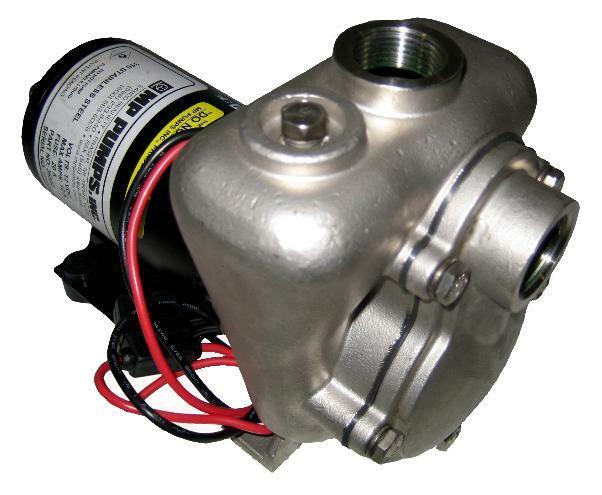 MP Pumps FRX75-SP all 316 Stainless 115V self priming centrifugal pump, 1/6 HP #35321. Ideal for marine, industrial, agricultural or commercial applications with suction lift. A carbon/ceramic/viton bellows shaft seal is standard. 3/4" NPT ports with 1/8" NPT fill port. The O-ring/flapper design allows up to 12 foot suction lift. Application: Marine, Industrial and Commercial. Construction: Stainless steel (investment cast) housing, cover and wear plate, with viton O-ring/flapper, 316 stainless steel impeller semi open (sintered PM). Maximum Flow: 21 gallons/min, Best Eff. Flow 12 Gallons/Min, (TDH)Total dynamic head @ 0 GPM in PSI 10.82, (TDH) Total dynamic head @ 0 GPM in feet 25. Maximum Operating Temperature: 180 F Suction Lift: 12 Feet Max. Volume of Suspended Solids: 2 % Mechanical Seal: Carbon/ceramic/viton bellows 150 PSI Motor: TENV, 1/6 HP, 115V AC , 1 phase, 3450, 2.8 amps, 60HZ. Port Sizes: 3/4" NPT, 1/8" NPT Fill Port Weight: 18 lbs.